What’s up with these pics? I’ll explain later in this post. But first, a word about the midterm elections. The local candidates that my neighbors and I were rooting for and worked hard to support, did not get elected. The eco-conscious and responsible-development candidates in the next town over, and in the county, who I would’ve voted for if I’d been able to vote in those districts, lost also. Most of them lost by respectable margins of 5% or less, and some by quite narrow margins, indicating that there’s a lot of public support for the ideas “our” candidates built their platforms on. Protecting the environment, attracting responsible development, supporting small local business, valuing historic architecture, and so on. And, what I always say about elections is: No matter who wins, we will all still wake up tomorrow and have to work together. So, although the candidates I was rooting for didn’t get in anywhere, I will still be me, showing up at meetings, writing emails, and all that. Most of all, I will be looking for common ground. ALWAYS. Because there ALWAYS IS common ground. The person who got elected to City Commission in my zone did not seem to have a platform. If she had one, my neighbors and I didn’t hear about it. And she sent out some cheaply insulting mailers. But obviously a lot of people, including some of my friends, think highly of her. I will find out what my new Commissioner cares about, focus on her as a fellow human being, seek common ground, and work through channels, the way water finds channels (or creates channels!) as it flows. Because we are ALL STILL HERE, and what’s the alternative? Non-participation? Or just trying to tear down “the powers-that-be”? Nope, not an alternative, neither one of those. Whenever I observe waste, destruction, foolishness, or just plain limited thinking, I will continue to call it out, but in the most constructive possible way, always seeking to offer a better alternative rather than merely disparage what the powers-that-be are doing. And I hope you will do the same, whatever you feel about the election results. The world is always in need of good ideas, better design, better alternatives. Share your ideas whenever possible, as publicly as possible, through whatever channels you feel comfortable sharing. And most important, LIVE your better ideas to the fullest extent possible. That’s what’s so great about the low-footprint lifestyle movement: We get to take charge and LIVE our best version of the world we want to create. Day in and day out, we get to vote with our wallets and our sharpened minds, for millions of choices, without regard to who is or isn’t elected. Every day I vote for walkability by patronizing establishments that are in walking distance, even if I have to pay a few bucks extra. (It ends up being less in the long run or even in the short run.) I vote for beauty by living in historic neighborhoods. I vote for forests and wetlands by planting trees in my yard. 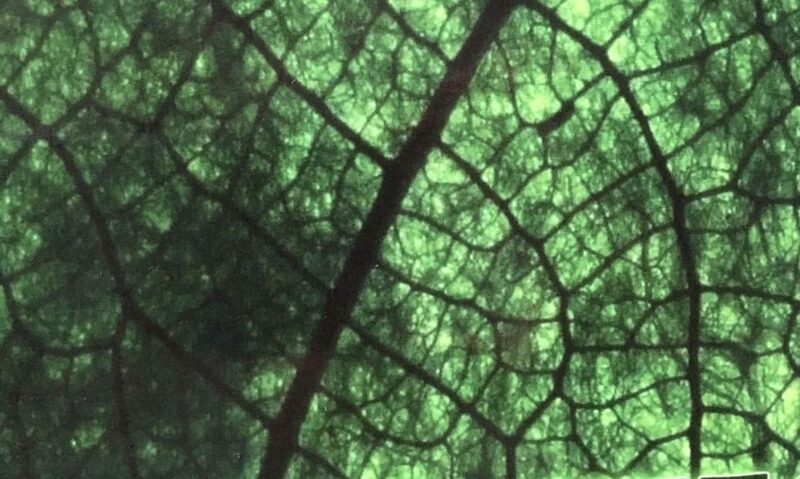 On the subject of living what we prefer, and casting our vote each day, today’s photos show a new creation of mine. 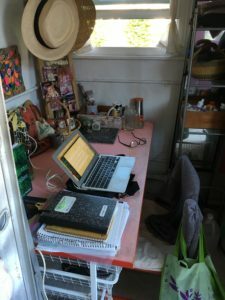 This is my micro-studio, which some of you may have seen in previous posts, but this week I made a major addition to it: I turned it from just my art and writing studio/office, into my entire living space including sleeping area and clothing storage. Basically, I have created a tiny house within my 988-square-foot house! This thrills me to no end. I got the idea just recently. It struck me very strongly that while I adore my house and hope to grow old here, I still yearned for the compact functionality and bohemian paisley genie-bottle feel of my little RV that I lived in years ago in south Austin, or the many “roomettes” I’ve created in shared apartments over the years. 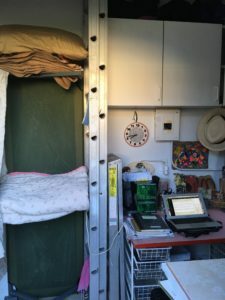 So … I have now simply created a tiny house or roomette inside my house, even though the “normal” thing to do when you own a house is occupy one of the bedrooms. The bed (a sturdy but still lightweight cot*) easily leans up against the wall in daytime and becomes the storage rack for my pillow, blankets. I felt exhilarated as soon as I moved the cot in and figured things out. Now all my pens, notebooks and other supplies are in one room. No more having to wander across the house into a separate bedroom to see if I left my water-glass or writing supplies there during the night. (I know 988 square feet doesn’t give me far to have to wander, but the feel was sort of sprawl-y and unappealing to my aesthetic.) Now things are cute, compact, tightened-up, reachable. It’s energizing and (to me) beautiful. At night, when I’m lying on the cot, I can look out the door and see the sky. Because this micro-room happens to have its own door to the outside (it opens to my fenced backyard). So it really does feel like having a tiny house or RV in my own backyard! And, as the icing on the cake, I now have TWO big bedrooms available for guests and roommates, rather than just one! Living with other people reduces everyone’s eco-footprint through reduced financial overhead, and through sharing of household resources such as a fridge, dishes, tools. The dimensions of my tiny house-within-a-house are 6-1/2 by 7-1/2 feet. Somehow it seems larger, at least 8 by 10! I wrap this post up with a bit of advice: Vote with your hands and feet; vote for the world YOU want, no matter how wild or weird it might seem from a mainstream viewpoint. Create it; live it. The world needs your creative expression.